Isn’t your kitchen one of the great places of your home where you chat and enjoy with your family, relatives and friends? Then why not give it a special and personal touch? Yes, it must definitely be given a finishing touch. Usually people gather in the kitchen for meals, then how about having an antique piece of dining table in the kitchen? It will surely add to your taste. Selecting proper furniture for your home is definitely a tremendous task, but it is something that needs to be done on priority and with great care. Similarly, purchasing a dining table must also be done with great care and keeping many factors in mind, as it is going to be the centerpiece of your kitchen. Having a perfect dining table for your kitchen will help you manage rest of the things properly, in a proper manner. Once you get what you want, then you are doubtlessly going to spend some of the quality time of the day with your loved ones, dining happily. Dining table for the kitchen is not merely a necessity but also an important piece of furniture that needs to be functional as well as stylish. Today, kitchen dining tables are available in several varieties that differ in shapes, sizes and materials. There are dining tables that suit every style of home owner, whether modern or traditional. When you head out for purchasing a dining table for your kitchen, you will get to see numerous designs, styles and finishes that will go perfect with your kitchen furnishing. Depending upon the way in which your kitchen is styled and designed, you can choose the appropriate dining table. Another important factor that should be considered while buying a dining table for your kitchen is the size as well as shape. First and foremost take an account of the space available in your kitchen for placing a dining table. Depending upon the space select the suitable size and shape like round, rectangular, oval or square. Secondly consider the number of members in your family for buying that much seater dining table. Along with the table, you must also be able to occupy the number of chairs in that available space. You can pick the right 4 seater, 6 seater, 8 seater or extending dining table. 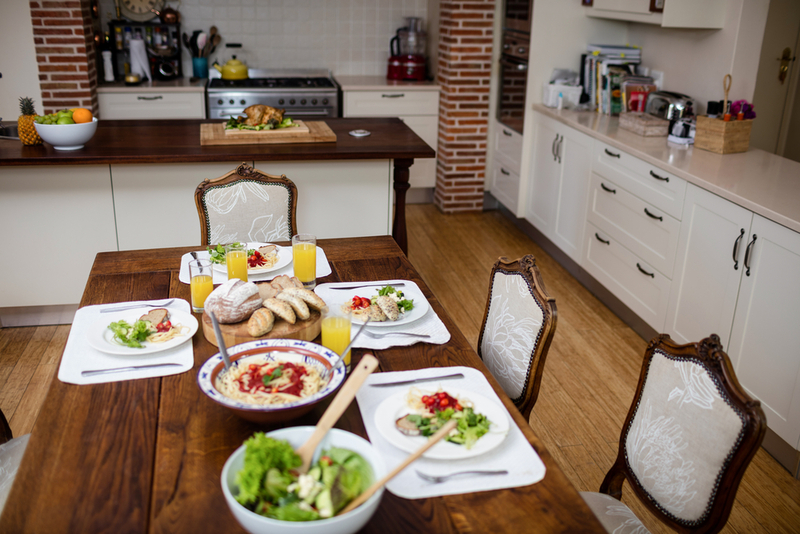 If you have more than 8 people in your family, extending dining table is just the perfect option for you. You can get plentiful options for diverse colors as well as finishes. Material is also one of the concerning thing that you need to see before buying a dining table for the kitchen. According to the furnishing of your kitchen as well as home, you need to select the material for your dining table such as wood, glass, chrome or stainless steel. Glass dining tables or glass top dining tables with chrome finished legs or stainless steel base go ideal with every home décor. Wooden dining tables are built for traditionally designed and styled kitchens. No matter, which material, style, design, color, shape or finish you choose for your kitchen dining table, make sure it matches the overall furnishing of your home. Additionally, make sure that the table you choose is sturdy as well as durable, apart from being stylish and elegant. Considering all the factors given above, select some of the most happening and stylish piece of dining table for your kitchen.